I often ask students in Master Gardener classes "what is a buttonwood tree?" to illustrate the challenge with common names of plants. Unlike scientific names, there is no recognized governing body that standardizes common names of plants. Consequently, plant names may vary widely (wildly?) owing to differences in the cultural backgrounds of people living in different geographical regions, among other things. Typically, those who correctly answer that "buttonwood" is another name for American Sycamore (Platanus occidentalis) have one of two things in their backgrounds. They hail from a region in the eastern U.S. with a long history of manufactured wood products, or they have some background in finance. Buttonwood refers to the fine grained wood of the American sycamore which was often used for making wooden buttons. Sycamore wood can be finely milled without cracking; perfect for producing long-lasting clothing and shoe buttons. Indeed, my West Virginian grandfather always called sycamore trees "buttonwood." If you do a Google search, you may find a number of financial and stock brokerage firms with "buttonwood" in their names. That's because the New York Stock Exchange can trace its roots, literally, to a buttonwood tree that once stood outside of 68 Wall Street in New York City. On May 17, 1792, 24 stockbrokers met under this tree to sign an agreement that started the New York Stock & Exchange Board; now known as the New York Stock Exchange. The signed document is referred to as "The Buttonwood Agreement." The far reaching significance of that agreement was demonstrated on October 19, 1987. The date fell on a Monday which became known as "Black Monday" owing to the stock market crash that sent the Dow Jones Industrial Average plummeting by almost 23 percent in one day. It remains the largest one-day decline in the history of the stock market even topping the crash of 1929. Tomorrow marks the 30th Anniversary. An American sycamore figured prominently into the first permanent settlement west of the Alleghenies celebrated by Pringle Tree Park located just north of Buchannan, WV. John and Samuel Pringle deserted the British-American army at Fort Pitt around 1764. We sometimes forget about this allied army fought together in the French and Indian War. The brothers fled into wild and wonderful West Virginia and holed-up, literally, inside a huge, hollow sycamore tree. The large tree cavity served as the brother's home for about 3 years until they ran out of provisions. The Pringles finally left their buttonwood abode in search of food (potato chips?) and soon learned they were no longer wanted men. They eventually returned to the site to set-up a permanent settlement, presumably with people living in homes made from trees rather than in trees. Supposedly, an American sycamore growing on the site is a third generation direct descendent from the original. The rich history behind our American sycamore is only one reason it's one of my favorite native trees. It's one the largest trees found in our eastern forests; trees topping 100' with 5' DBH trunks are not uncommon. The spreading graceful branches impart a stately profile and there is nothing like its stark white trunk. I cannot think of another tree that presents such a dramatic appearance in the winter; the common name "Ghosts of the Forest" is well earned. This wonderful characteristic will soon be revealed. Of course, no living thing is ever perfect and American sycamores have their detractors starting with the Wyandotte tribe. They had a story that the great chief who ruled over evil spirits grew so angry with two of his acolytes he cast them to Earth where they fell upon two sycamore trees and their wicked nature infused the trees to cause them to become deformed with twisted branches. Even one of our most ardent tree lovers, Michael Dirr, apparently had some issues with American sycamore. In the 6th edition of his Manual of Woody Landscape Plants, Dirr describes a disagreement with a city forester over a sycamore: "… the city forester and I had several bouts over the removal of a plant that happened to be located in the tree lawn (parkway) bordering my property; I wanted to remove the tree and he did not approve; I did end up removing the lower branches; the tree was forever dropping part of its anatomy but was truly at its "best" when anthracnose kept it devoid of leaves until mid to late-June." 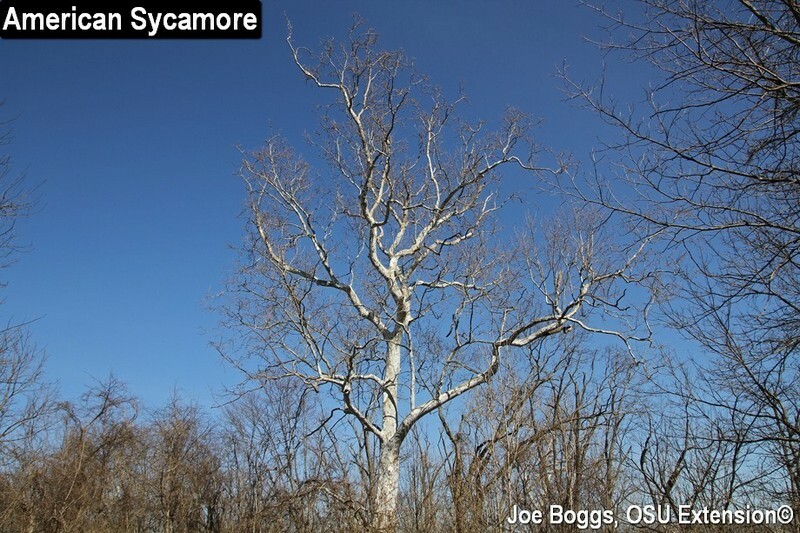 An interesting perspective on the fungal anthracnose disease that may defoliate sycamores after high infection rates are induced by an unusually cool, wet spring. I admit there are a number of challenges with our American sycamores. This includes "dropping part of its anatomy" such as bark, twigs, large leaves, and fruiting balls with their accompanying fluff all of which can present serious clean-up problems. There's also a problem with the fluffy, hair-like material covering the leaf surfaces (indumentum). It commonly detaches producing coughing fits in those such as me who are sensitive to the intrusion. As much as I love the tree, it apparently doesn't love me. Perhaps Dirr makes a very good point about appreciating sycamores from afar when he concludes his "Landscape Value" with, "… in a native situation especially along water courses it is an impressive sight in the landscape."